Anaplan, the leading provider of cloud-based “Connected Planning” software for large enterprises, filed for a $100M IPO (amount is a placeholder). The company has not yet picked an exchange but plans to trade under the ticker “PLAN”. Goldman Sachs is leading the offering. Anaplan is a competitor to Adaptive Insights, which Workday acquired prior to their IPO for $1.6B, but focuses on more upmarket customers. Anaplan describes their Corporate Planning solution as an essential cloud category that helps companies plan more effectively by “connecting all people, data and plans to accelerate business value and enable real-time planning and decision-making in rapidly changing business environments”. Anaplan’s corporate planning software is suited for companies of all sizes but their focus is on the world’s largest companies. The company did $109.4M of revenue in the first 6 months of 2018 (ending July 31) and has almost 1,000 customers in ~50 countries. Anaplan was founded in 2008 and first launched their product in 2011. They’re based in San Francisco, CA and had 1,102 employees as of July 31, 2018. As of July 31, 2018, Anaplan had 979 customers. Of these, 220, including 23 of their top 25 customers, were members of the Global 2000. The revenue generated from Global 2000 customers represented 56%, 54%, 55%, and 56% of total revenue in fiscal 2016, 2017, and 2018, and the six months ended July 31, 2018, respectively. Anaplan’s top 25 customers by average ARR as of their most recent quarter (23 of which are enterprise customers included in the Global 2000), had an average ARR of ~$2.3 million, compared to an average ARR from their initial purchase of ~$360,000, an increase of 6.4x. The revenue from these 25 customers made up 29% of total revenue in FY’18 and 26% of total revenue in the six months ended July 31, 2018. The number of customers with greater than $250,000 of ARR was 59, 113, 181, and 213 as of the end of FY’16, FY’17, FY’18, and July 31, 2018, respectively. They are now 22% of total customers. 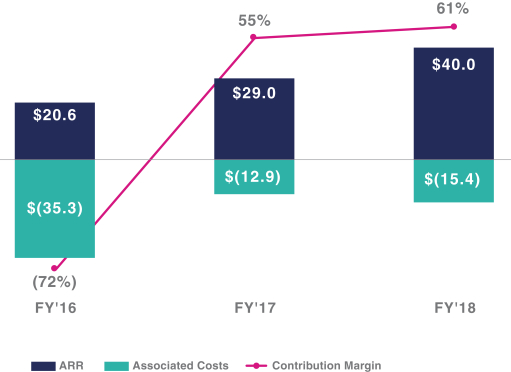 Anaplan’s annual dollar-based net expansion rate was 135%, 123%, 122%, and 123% as of the end of FY’16, FY’17, FY’18 and as of July 31, 2018, respectively. In the last 12 months, 41% of their total revenue was generated through leads originated from Anaplan partners. Over the last 2 years, the company has shifted their sales strategy to increase focus on large global enterprises or Forbes Global 2000 companies. In the six months ended July 31, 2018, the company derived ~43% of revenue from customers outside the United States. As of January 31, 2018, the company had 4 issued U.S. patents. Anaplan sells their software through a direct sales force and has a network of consulting and implementation partners. 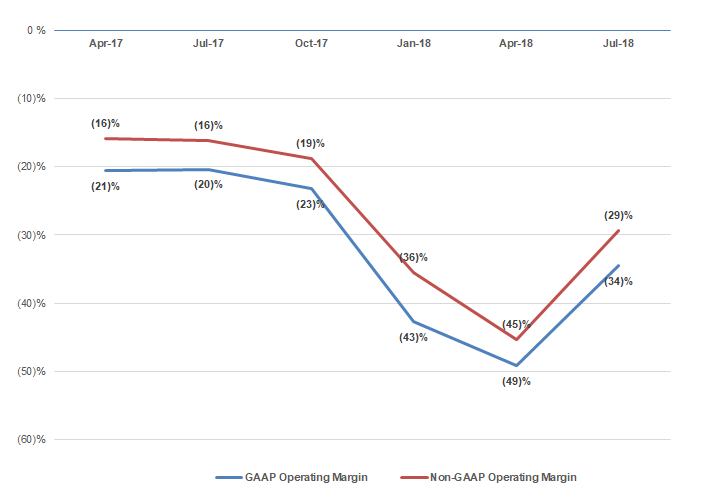 The company focuses on a “land and expand” GTM strategy and often starts with a line of business or corporate function, then expands — this is evident is their dollar-based net expansion rate, which is consistently above 120%. Their typical sales cycle is 3 to 9 months and professional services engagements can span from a few weeks to a few months. Anaplan’s initial subscription term is typically two to three years and they generally bill customers annually in advance. The company has tiered pricing based on the type of user, enabling modelers, users, and read-only participants to be part of the planning process. 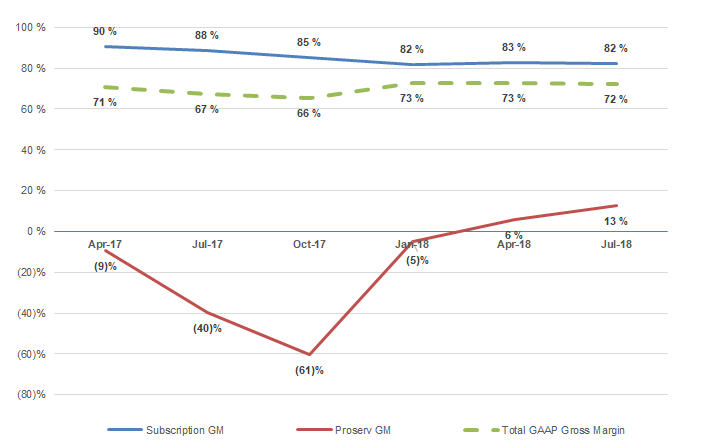 Anaplan is certainly moving further upmarket as evidenced by their customers over $250K in ACV, which is now 22% of total customers, up from 14% in FY’16. Sales: Managing sales performance, including incentive compensation, territory and quota planning, sales forecasting, account segmentation, and scoring, and sales capacity planning. Finance: Managing financial and overall enterprise performance, including financial budgeting, planning, and forecasting. Other areas include tax and treasury planning, financial consolidations and reporting, and long-range planning. Supply Chain: Managing supply chain performance, including demand planning, supply planning, sales and operations planning, inventory, and merchandise optimization. HR: Managing workforce plans and performance, including workforce and headcount planning, workforce optimization planning, succession planning, and global compensation. Marketing: Managing marketing performance, including trade promotion planning, pricing optimization, and marketing performance management. Operations: Managing performance for many additional operational areas, including IT, project budgeting and performance analysis, retail merchandise planning, call center planning, resource capacity planning for professional services, actuarial and premium modeling for insurance, capital planning for banking, clinical trial planning for pharmaceuticals, and commodity sensitivity analysis for consumer goods. Anaplan believes their market size to be ~$17B in 2018 and growing to $21B by 2021, according to IDC. That’s larger than what Adaptive Insights had in their S-1 ($12.5B) but Anaplan is playing in a larger market by targeting Global 2000 organizations — more than half of their revenue comes from that segment. They also reference research which shows there are 72 million workers worldwide that are potential users of their platform. The market is certainly in favor of Anaplan. It would be hard to imagine enterprises going back to Excel, on premise systems or other manual processes for corporate planning, particularly as organizations want to be agile and gain efficiencies. While Anaplan’s market is likely greenfield in many cases with regard to modern cloud solutions, there are legacy players like Oracle, SAP, and IBM that have on premise applications as well as cloud-based versions morphed from their on premise solutions. In addition, they mention competition from Adaptive Insights which is part of Workday and Callidus Software, which is a company SAP acquired. Lastly, they're still competing with decentralized manual processes, such as Excel. According to Pitchbook, Anaplan has raised $300.1M to date from investors including Shasta Ventures, Premji, Granite Ventures, Meritech Capital Partners, Coatue, DFJ Growth, Harmony Partners, Industry Ventures, Salesforce Ventures, and others. 5%+ pre-offering VC shareholders include Shasta (12.8%), Granite Ventures (12.1%), Coatue (7.7%), Meritech Capital Partners (7.6%), and Premji (7.4%). Frank Calderoni, President, CEO, and Director is at a 3.4% pre-offering stake. Anaplan raised their last round of funding, a $60M series F led by Premji in November of 2017 at a $1.4B post-money valuation, according to Pitchbook. 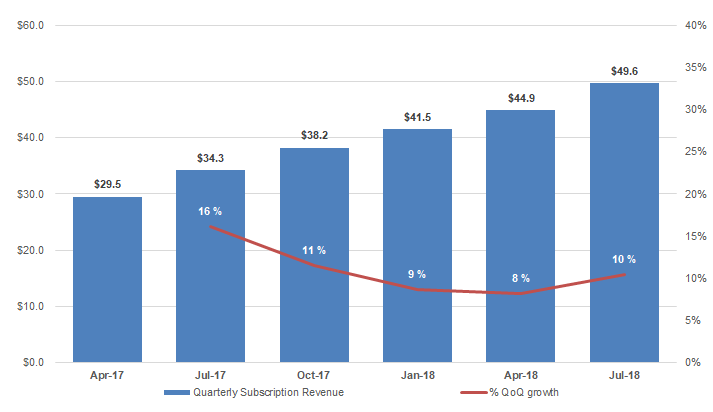 Anaplan is growing subscription revenue 45% YoY and almost $200M in implied ARR. Their dollar-based net expansion rate is consistently over 120%. 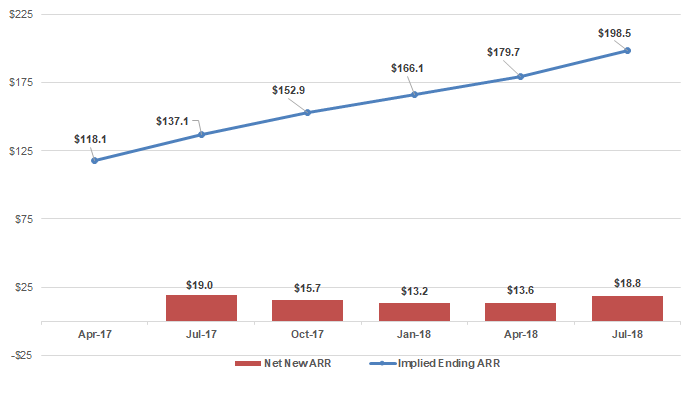 They are spending to sustain this growth, and over the past 5 quarters, their implied ARR has grown by 1.7x and sales and marketing by 1.8x. 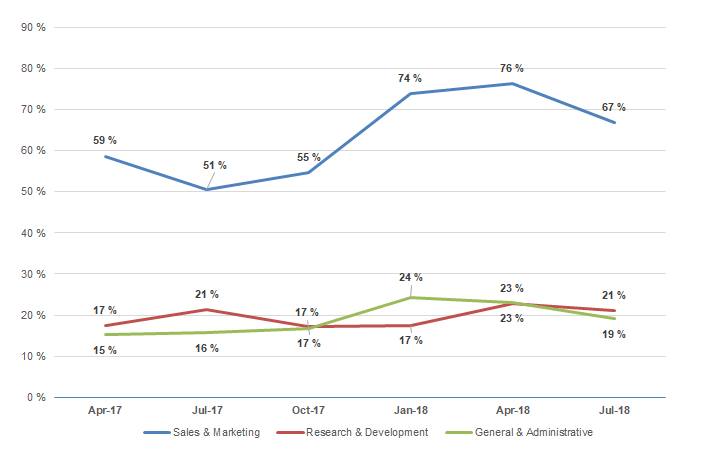 Sales and marketing has also increased as a percentage of revenue in the past few quarters, which makes sense since the company is focusing more on Global 2000 customers and wants to continue their high growth. 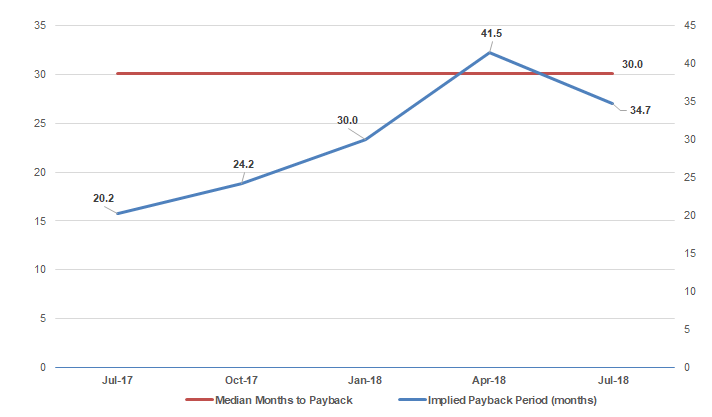 In terms of sales efficiency, their months to payback using a CAC ratio (implied net new ARR * gross margin / sales and marketing spend of prior quarter) was at a 30-month median over the past 5 quarters, which is better than Adaptive Insights, which was at 42-months. Adaptive Insights also had lower dollar net expansion at 98% in their last reported fiscal year. 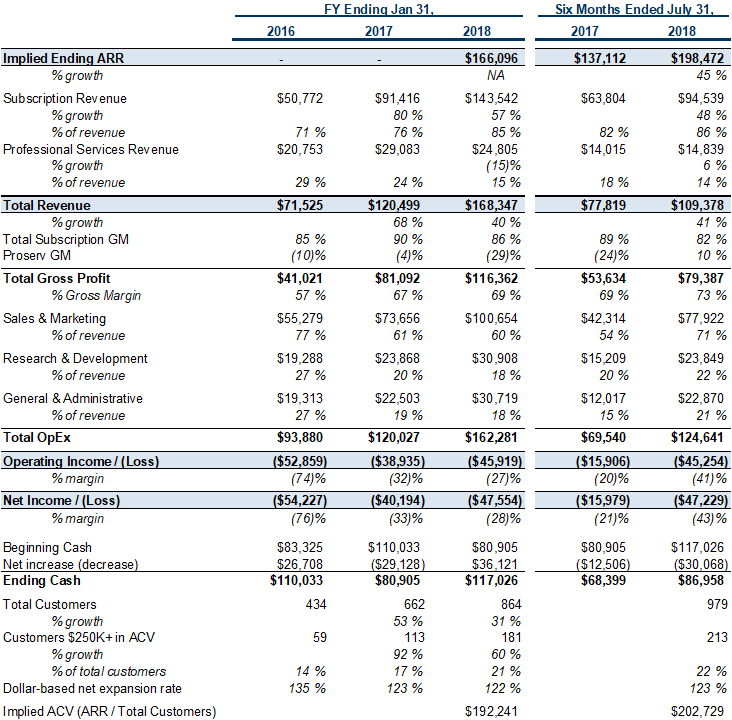 Anaplan has $87M in cash on their balance sheet. In terms of sales efficiency compared to other 2018 SaaS/cloud IPOs, Anaplan is at the median. 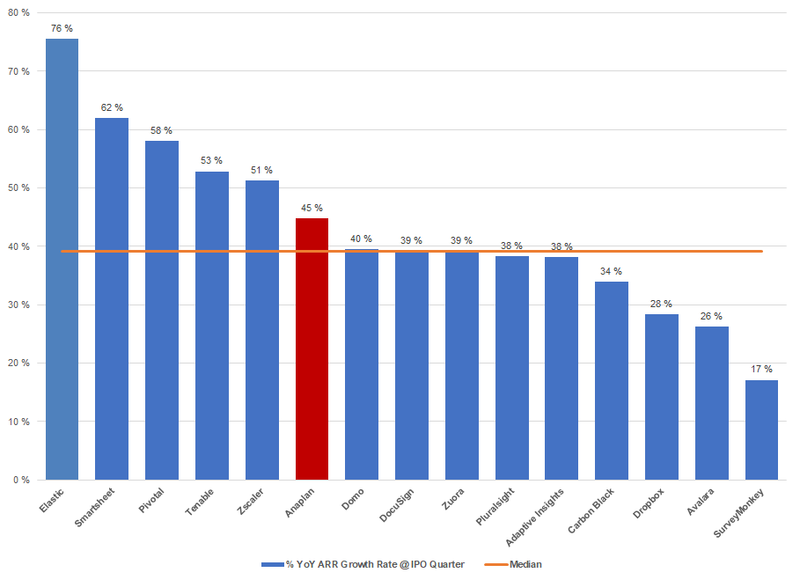 They’re above the median with regard to YoY ARR growth. 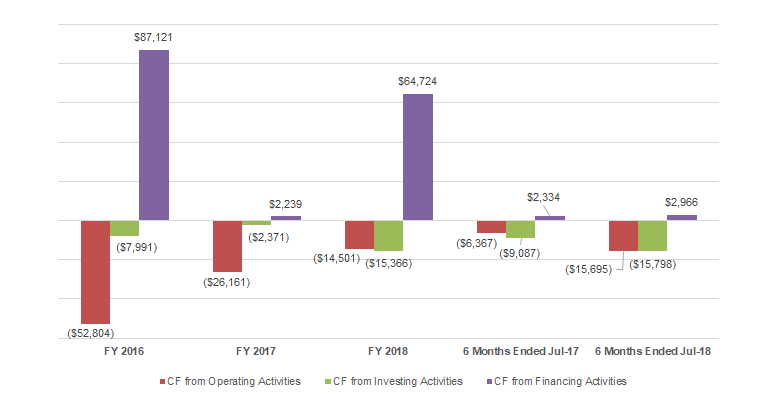 Outputs of other Anaplan financials and metrics are below. Anaplan has added $18.8M of net new implied ARR last quarter and $61.4M over the past year. 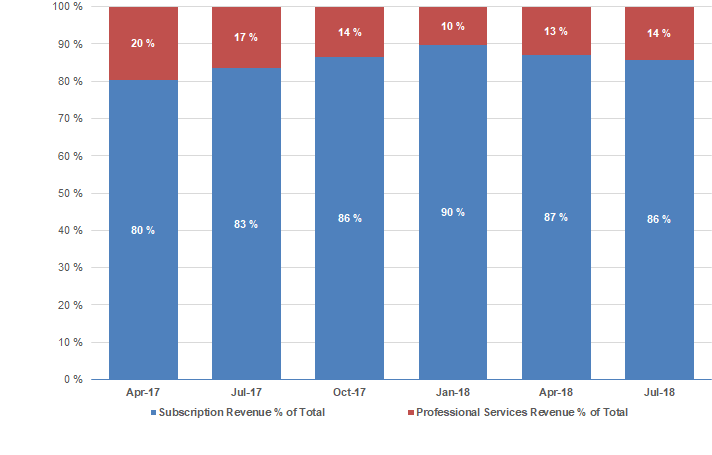 Almost 90% of Anaplan’s revenue is subscription based. Anaplan is moving further upmarket which typically entails longer and more expensive sales processes — it’s evident in the numbers below. The output below has their implied months to payback using a CAC ratio (implied net new ARR * gross margin / sales and marketing spend of prior quarter). The company discloses their contribution margin for their FY’16 cohort, which represents 180+ customers. The company defines contribution margin as “the total amount of annual recurring revenue from the customer cohort at the end of a period, or ARR, less the estimated associated cost of subscription revenue and estimated associated sales and marketing expenses, or associated costs”. 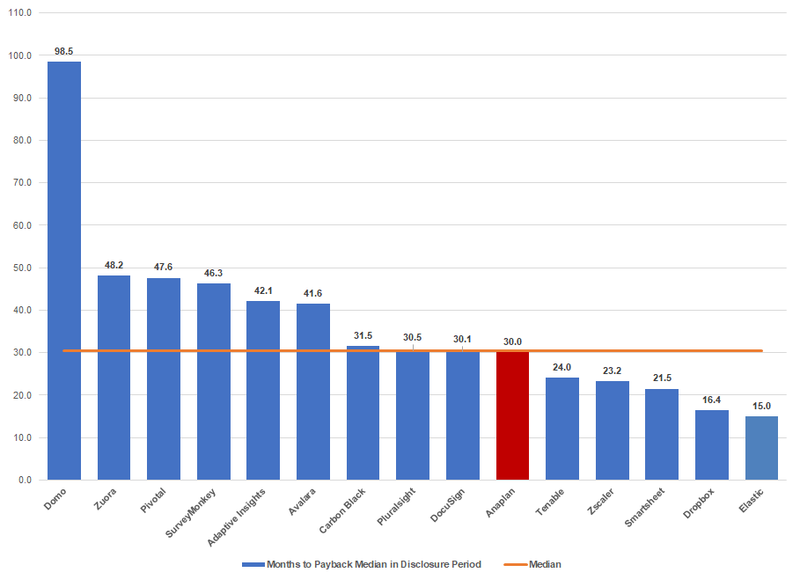 Not surprisingly, their customers become very contribution margin positive over time. 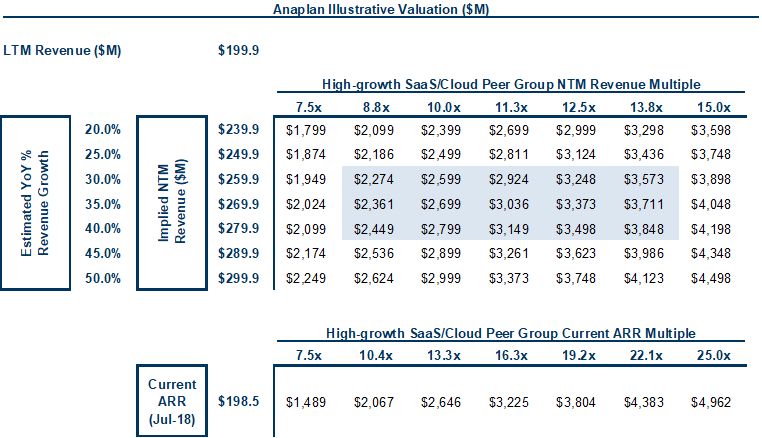 Anaplan will most likely be valued on a multiple of forward revenue and NTM (next-twelve-months) revenue is a safe assumption as a primary valuation methodology given they are not yet profitable. The output below uses illustrative NTM revenue figures based on a range of growth rates against public SaaS/cloud multiples. 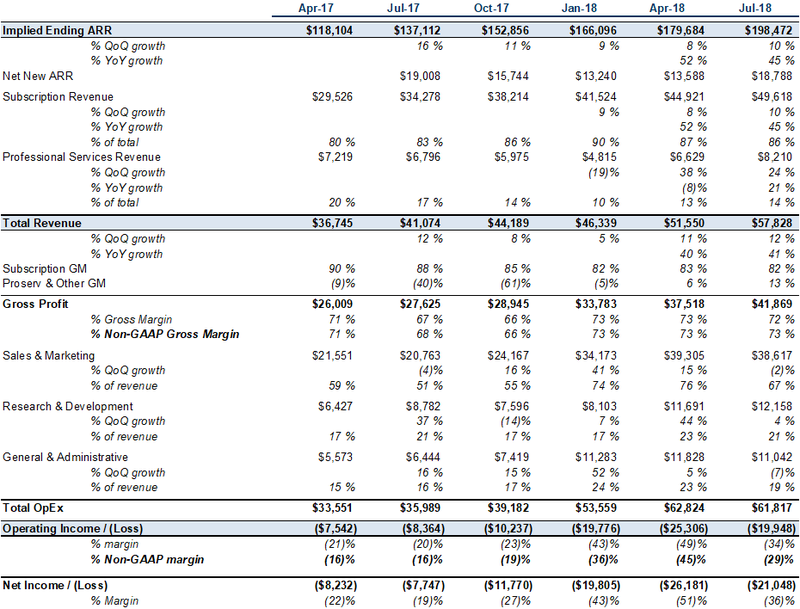 Below that is an implied ARR multiple table based on the same public high-growth software comparables. It would be surprising if they don’t trade well above their last private round of $1.4B given their growth, scale, and public comparables. Note: Enterprise value ranges and growth rates are illustrative. Anaplan is the leading independent cloud-based solution for corporate planning for large enterprises. While they’re still losing money, they have a strategic position in the market and it’s hard to imagine companies don’t continue to adopt a system of record for corporate planning like Anaplan, particularly in large enterprises — the market opportunity is huge. They also already have a foothold in many Global 2000 organizations. Adaptive Insights, which mostly focused on the mid-market, was acquired days before their IPO for $1.6B and was half the size of Anaplan and growing slower. Anaplan should have a very successful IPO.